Protect against the Harmful Organisms: Water may be contaminated with microorganisms that may cause vomiting, diarrhea etc. A proper water purification system damages these harmful microorganisms for making the water clean and safe for drinking. Remove Toxic Metals: Polluted with can be contaminated with minerals, such as magnesium and copper along with microorganisms. Some of the minerals may not create any health problems but they may create reactions along with other types of minerals present in the water and as a result, deposits can cause that can make an unsuitable water for drinking. Some other minerals, such as copper and lead, can be contaminated with water and can create health problems. Perfect Taste: The taste of water is also another important criterion. Contaminated water may be associated with some awkward taste. But, with the help of an appropriate water purifier, the perfect taste of the water is achieved. So, it is very important to stay away from these types of contaminated and polluted water. RO (Reverse Osmosis) water purifiers are the best method in order to treat the hard water and these types of water purifiers remove various toxins, such as mercury, lead, Arsenic, Fluoride, Chlorine that can cause health issues. Lead can be responsible for anemia and brain damage. 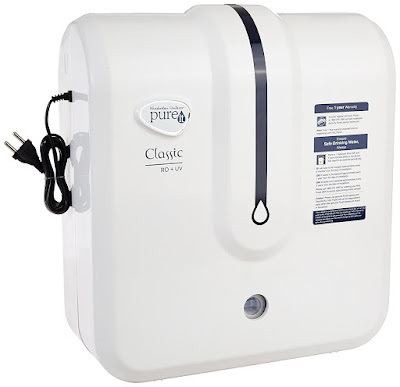 The Pureit Classic RO+UV water purifier is a high performing and incredible water purifier that is featured with a 6 stage purification technology. It gives you pure and clean drinking water. It is suitable for any kinds of water resources like tap water, bore wells, and hard water. It decreases the TDS of water and also destroys each and every harmful microbe for providing a safe and pure drinking water. 6 Stage Purification Technology: In this particular water purifier, the water purification process starts in the pre sediment filter. It removes the coarse impurities along with dirt perfectly from this inlet water. Its second stage is featured with an amazing pre-RO carbon filter. It helps to remove bad odor, organic compounds, chlorine from the water. At stage three, an incredible carbon sediment filter perfectly removes the final impurities. It also improves the life of this particular RO membrane. Its unit of reverse osmosis removes total dissolved heavy metals and salts from the water. At the next level, an impressive ultraviolet filter destroys each and every micro organism along with cysts, exist in water. In the last phase, a post RO carbon filter perfectly strains the remaining (if any) microscopic impurities. A perfect taste is also added by it in the water. 90 per cent Reduction of TDS: This Pureit Classic RO+UV water purifier removes 90% of overall dissolved solids. Storage Capacity: It is involved with a tank along with the capacity of incredible 5 liters. This purifier is also associated with an amazing auto shut off function. Engineering Grade Plastic Body: This water purifier is featured with an incredible engineering grade plastic. It is very stylish and durable. It is safe for using and also very easy to maintain and clean. GermKill Kit: Pureit Classic RO+UV water purifier’s Germkill performance fulfills the international standards for microbiologically safe drinking water. It’s combined filters along with ultraviolet filtration phases make sure of the maximum micro organisms removal. Other Important Factors: It is perfectly suitable for most of the houses as well as buildings (multi storied) as it is associated with the rating at pressures of up to 2 Bars. So, Pureit Classic RO+UV water purifier is really a great water purifier with all types of important features. We can’t compromise with the water health as it is directly connected with our health and with this small investment, you can achieve a better health for you and your family. Clean and purified water is our basic need and Pureit Classic RO+UV water purifier can be the best water purifier for you and your family. You should install this water purifier at your home as early as possible. How To Solve Ceiling Fan Problems at Home?